If you missed last week’s issue of “Inside NCECA”, you can read more about how Bus Tours work and learn all about the New Bedford Bus Tour here. This week, I have TWO tours to share with you, Boston and Newport! During our board meetings in Providence, I had the opportunity to go to both of these beautiful cities and see several of the spots on the tours. 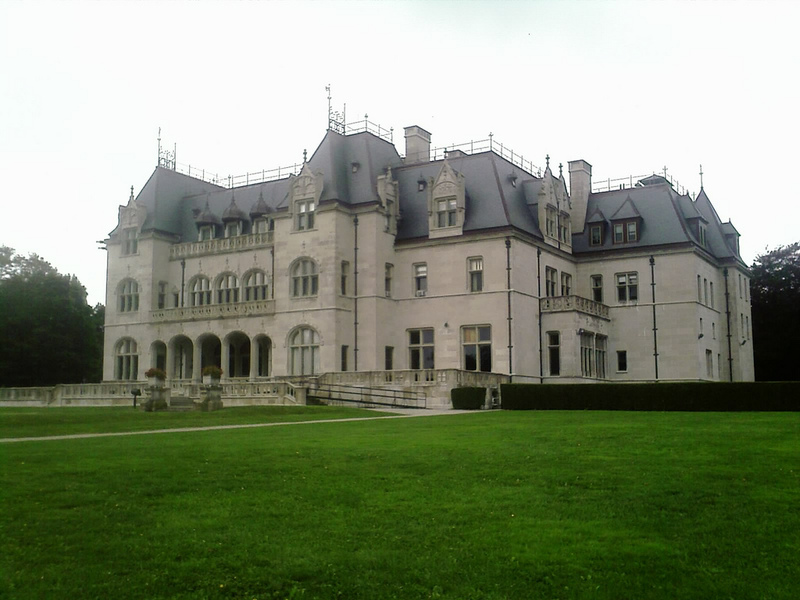 Salve Regina in Newport is a beautiful campus and the Newport Art Museum is charming. Harvard Ceramics in Boston is amazing with a bright and open gallery space and a fabulous facility. Collaborators – A Lively Experiment, Ashwini Bhat, Bryan Czibesz, Dan Molyneux, Elizabeth Kendall, Lori Mader, Julie Crosby, Rose Esson-Dawson, Seth Rainville, Liz Lurie, Tom O’Malley, Shawn Spangler and Adam Paulek. The challenge of creating work while separated by distance, creating limitations for the collaborators was explored by 12 artists. Potters, sculptors and installation artists developed ways of communicating ideas over distance. Organized by Rose Esson-Dawson. Hours during NCECA: Sun-Tue 12-4pm; Wed 9am-5pm; Thu 9am-8pm; Fri 9am- 9pm; Sat 9am-8pm. Reception: Fri, Mar 27, 6-9pm. Feb 19-Mar 28. Learning Curves, Ellen Blomgren, Rose Esson-Dawson, Pat Warwick, Candis Dixon, Adam Ferbert, Judi Israel, senior students. An inspiring collaboration between six young artists in their senior year of high school and six experienced and talented, ceramic artists at 30 Cutler Street Studios. Organized by Ellen Blomgren. Hours during NCECA: Sun-Fri 10am-4pm; Sat 10am-8pm. Reception: Sat, Mar 28, 6-8pm. Feb 6-Mar 28. Birds, Bart Fetz, Alex Kraft, Peter Callas, Jill Burns, Nel Bannier, Eva Kwong, Krysia Stronski, Doug Grey, Dandee Pattee, Janis Mars Wunderlich, and others. The Audobon Society of Rhode Island Education Center will host an exhibition of ceramics, drawings, paintings, water colors and prints done by clay artists from around the region and country. Organized by Anthony Merino. Hours during NCECA: Wed-Sat 9am-5pm; Sun 12-5pm. Reception: Wed, Mar 25, 3pm. Mar 25-28. Sculptural Explorations: Resource Consumption, Creation, and Trade, Allison Newsome and Nancy Selvage. The exhibit will include ceramic installations by two regional artists, Allison Newsome and Nancy Selvage. The installations will interpret and explore cultural production, consumption and trade of our region. Curated by Mary Dondero. Hours during NCECA: Sun-Tue 1-4pm; Wed 10:30am-4pm; Thu-Sat 1-4pm; open Fri until 9pm Free Admission with NCECA Conference Badge however, $2 contribution is appreciated. Reception: Fri, Mar 27, 6-9pm. Mar 6-Apr 19. Figure/Vessel/Figure, Lee Segal and Valorie Sheehan. A potter and a sculptor collaborate to pursue the figure using a range of clay bodies, firing temps, atmospheres and forms. Narrative to abstract. Wheel thrown, hand built. Organized by Valorie Sheehan. Hours during NCECA: Closed Mon & Tue; Wed 11:30am-5pm; Thu-Sun 1-5pm. Mar 22-28. Ashwini Bhat: “Earth Took of Earth”, Ashwini Bhat. Ashwini Bhat’s solo exhibition is a body of wood-fired sculptural ceramics, employing a primary language of transformation, taking conceptual gesture and rendering it material. Curated by Nancy Whipple Grinnell. Hours during NCECA: Sun 12-4pm; Mon closed; Tue-Sat 10am-4pm ; Extended hours Fri until 8pm. Jan 17-May 10. Gerry Williams – Effigies in Clay, a Memorial Tribute, Gerry Williams. 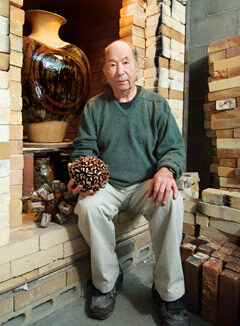 Salve Regina University honors the creative legacy of New Hampshire potter Gerry Williams. This exhibition features Williams’ ceramic work from his family’s collection and other private collections. Curated by Dorrance H. Hamilton Gallery at Salve Regina University. Hours during NCECA: Tue & Thu 11am-6pm; Wed 11am-5pm; Fri 11am-8pm; Sat 12-4pm. Reception: Fri, Mar 27, 5-8pm. Mar 24-Apr 19. Palace Pottery, James Baker, Susan Harris, Michelle Erickson, Jay Lacouture. Work by four artists in a historically significant “Guilded Age” building that responds to the decorative aspects of pottery form. Organized by Jay Lacouture. Hours during NCECA: Wed & Thu 10am-5pm; Fri 10am-9pm; Sat 12-5pm. Reception: Fri, Mar 27, 6-8pm. Mar 25-Apr 3. 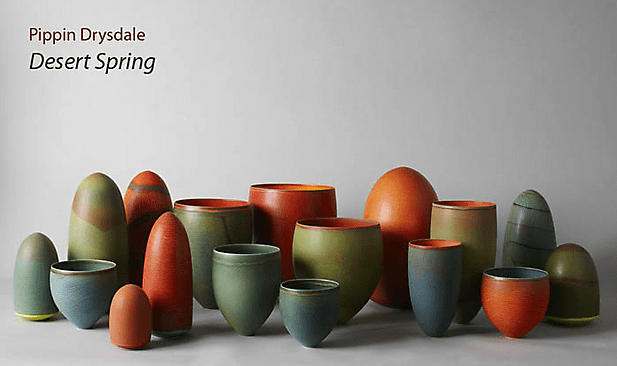 Fired and Inspired: Ceramics at Rough Point, Mark Cooper, Kathy King, Judit Kollo, Warren Mather, Marco Vargas, Zhu Yang. New work by artists inspired by Rough Point and its history will be nestled among the house’s own collection, offering a fusion experience of art and history at this Newport mansion. Curated by Allison Newsome. Hours during NCECA: Wed open 2-3pm for Newport tour only; Thu-Sat 10am-2pm; additional hours Fri 5-8pm. Mar 25-Nov 8. Jamestown Arts Center Hours during NCECA: Sun 10am-2pm; Mon-Thu 9:30am-5pm; Fri 9:30am-8pm; Sat 10am-2pm. Reception: Fri, Mar 27, 6- 8pm. Mar 22-28. Both Artist and Mother, Jen Allen, Linda Christianson, Erin Furimsky, Molly Hatch, Jeannie Hulen, Eva Kwong, Kari Radasch, Ellen Shankin, Amy Smith, Michaelene Walsh, and others.. Kate Fisher has been documenting a selection of ceramic artists who are also mothers. This exhibition features the women of her research collaborations and the creative work they make. Curated by Kate Fisher. Conanicut Clay, Jillian Barber, Jennifer Clancy, Craig Crawford, Connie Payne Enright, Peter Flood, Lisa Harris, Martin Keen, Susan Matthews, Robin Monihan, Natalie Squillante. A survey of recent ceramic work made by artists who live or work on Conanicut island. Organized by Jillian Barber and Susie Matthews. NOTE There is a separate Newport SIGHTSEEING TOUR available from Lew White on Tuesday for soaking in Newport’s charm, atmosphere, dining and shopping. Details can be found on link above. Meredyth Knows Ceramics, Wesley Anderegg, Robert Brady, Angela Cunningham, Viola Frey, Koichiro Isezaki, Tim Rowan, Glen Takai, Peter Vandenberge, Jamie Walker, Sunkoo Yuh. 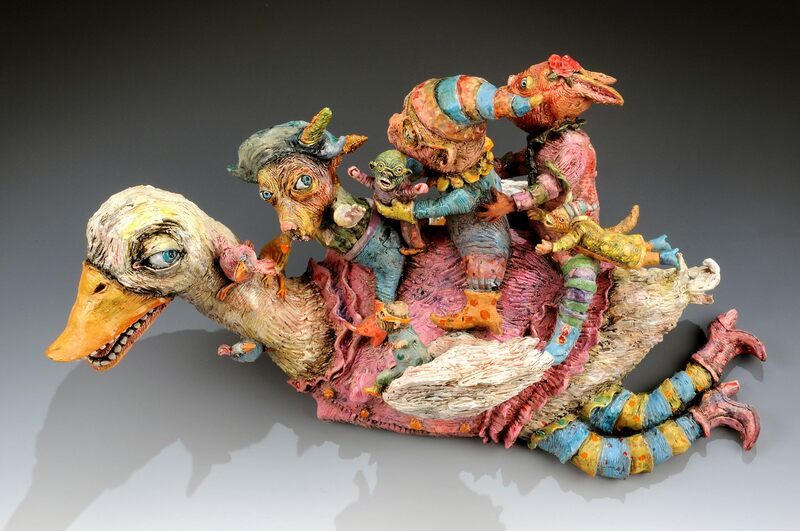 Meredyth Hyatt Moses revisits her ceramic heroes in an exhibition at Gallery NAGA representing national icons in the field of clay alongside a few shining new faces. Curated by Meredyth Hyatt Moses and Gallery NAGA. Hours during NCECA: Tue-Sat 10am-5pm. Mar 6-28. Collisions & Collaborations, Brian R. Jones, Kathy King, Kevin Snipes. For a year Jones, King and Snipes exchanged sketches, images and unfinished objects. The collaborative process culminated with a lively installation of new works. Curated by Fabio J. Fernández. Hours during NCECA: Mon by appt; Tue-Fri 10am-6pm, Sat 10am-8pm. Reception: Sat, Mar 28, 5-8pm. Jan 30-Apr 11. At the Crossroads: Pottery by Mark Hewitt, Mark Hewitt (main exhibition); additional works by Brother Thomas, Shoji Hamada, Randy Johnston, Ken Matsuzaki, Hideaki Miyamura, Ben Owen III, and others. Born in Stoke-on- Trent, England, Mark Hewitt apprenticed with Michael Cardew and now lives and works in Pittsboro, NC. Hewitt’s distinctive work is simultaneously rooted in tradition and contemporary in vision. Curated by Pucker Gallery. Hours during NCECA: Mon-Sat 10am-5:30pm; Sun 10:30-5pm. Reception: Sat, Mar 28, 5-8pm. Mar 22-28. Life, or Something Like It, Christopher Adams. Embracing “Lively Experiments” at the University responsible for the Blascka glass flowers, Adams presents an expansive homage to exploration of organic form in a full-gallery installation of over 1000 pieces. Organized by Co-Directors Kathy King and Shawn Panepinto. Hours during NCECA: Tue-Fri 10am-6pm; Sat 3:30-8pm. Reception: Sat, Mar 28, 5-8pm. Mar 24-28. Stay tuned to the blog for details on Continuous Shuttles and Exhibitions within walking distance of the Convention Center!